Since Advent of 2005 the Dominican Family worldwide has been preparing to celebrate the 800th anniversary of the confirmation of the Order of Preachers, which will happen in 2016. We began this grace-filled pilgrimage by commemorating the founding of the first Dominican community in Prouilhe – the birth place of the Holy Preaching. It is with great joy that I write this letter to announce the opening and the program of the Jubilee of the eight-hundred years of the confirmation of the Order of Preachers that we will be celebrating from the 7th of November 2015 until the 21st of January 2017 (cf. ACG Trogir 58, 3). This celebration of 800 years of the confirmation of our Order will coincide with that of the extraordinary Jubilee of Mercy announced by Pope Francis. The happy coincidence of these two Jubilees so dear to our history, our life and Dominican mission, to us this means a special call to renew our ministry of the Word, during the celebration of our eight-hundredth anniversary, around the specific mission of the Church: «announce the mercy of God, which in its own way must penetrate the heart and mind of every person» . The general chapter of Trogir have chosen as the theme of the Jubilee year of the Order “Sent to preach the Gospel” (ACG Trogir 2013, 50) and invite us to reflect on the following questions: For whom are we sent? To whom are we sent? With whom? What do we bring by being sent? This same chapter has given an answer to this last question: we are sent to preach the good news of the resurrection of Christ. We believe that his Resurrection is the definitive revelation of the Father’s love for Jesus and for the world. The resurrection of Christ is the clearest revelation of “the mercy of God for the poor”. Preach the resurrection is to preach a new path of friendship with God. It is this grace that made Saint Dominic into an exemplary preacher, “the preacher of grace”. This happy coincidence therefore allows us to unite our Jubilee year with the Jubilee of the Church -the preachers of the Gospel are the preachers of grace, and the preachers of grace are the preachers of the mercy of God. In the papal Bull of indiction of the extraordinary Jubilee of Mercy, Pope Francis expressed his intention to send missionaries of mercy during lent of the holy year 2016. As brothers and sisters of the Order, we feel particularly challenged, because from the first day of our entry in the Order, and before doing our religious profession, we ask for «the mercy of God and brothers». On his path of evangelical life, Dominic tried continuously to testify of Jesus, of the presence of the mercy of God among us, and it is for this reason that his life of preacher was his path of sanctity: since he decided, by a generous gesture of mercy to sell his books in order not to «study on dead skin when there were men who were dying of hunger», he was convinced that the evangelization of the Word of God must be done through the testimony of the charity of the truth. The solemn opening of the Jubilee of the Order will be held on November 7TH in each community of the Order. The general curia of Santa Sabina will inaugurate also solemnly the eight-hundredth anniversary of the confirmation of the Order with the celebration of the Eucharist during the feast of All Saints. I invite all the Provinces, Vice-provinces, communities, entities, congregations, fraternities and other Dominican institutions to celebrate this day in their communities, as a sign of fraternal communion in the confirmation of the Order which falls upon us now. During this Jubilee year of the Order, many international events will be held, including the calendar attached to this letter. Their purpose is to promote the participation of the entire Dominican family in these international meetings as well as those organized locally in each province, entity, congregation and community. I particularly urge the prior provincials to facilitate the participation of brothers to these Jubilee activities. Each event coordinator will inform you about the details regarding the registration and participation in each Jubilee activity. 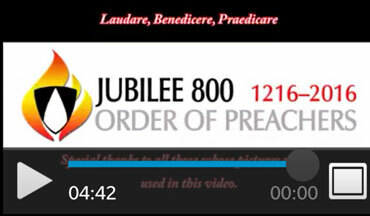 As “sent to preach the gospel”, during the Jubilee year, we will follow the path of the Word thanks to the Lectio Divina “the renewal of our Dominican life begins with the unification of our whole existence through attentive listening to the Word, a life of prayer and contemplation, in silence and study” (Cf. ACG Trogir, 42 ). It will have four sections: lectio, studio, meditatio et oratio. It will be published daily on the internet site of the Jubilee in the three official languages of the Order. For more information on the activities and the dates of celebration of the Jubilee of the confirmation of the Order, I invite you to visit our web site : http://www.op.org/en/jubilee. Our Holy Father Dominic wanted to guide the Order under the patronage of Mary, Mother of Mercy; that is the reason for which, until recently, we celebrated the anniversary of the confirmation of the Order on the 22nd of December at the same time as the feast of the Patronage of Mary throughout the Order. That Mary, Mother of Preachers intercedes for his Order so that God the Father of Mercy grants the sons and daughters of Dominic the grace of the Spirit, so they can announce, through their lives and their words in the world of today and tomorrow, the coming of mercy.